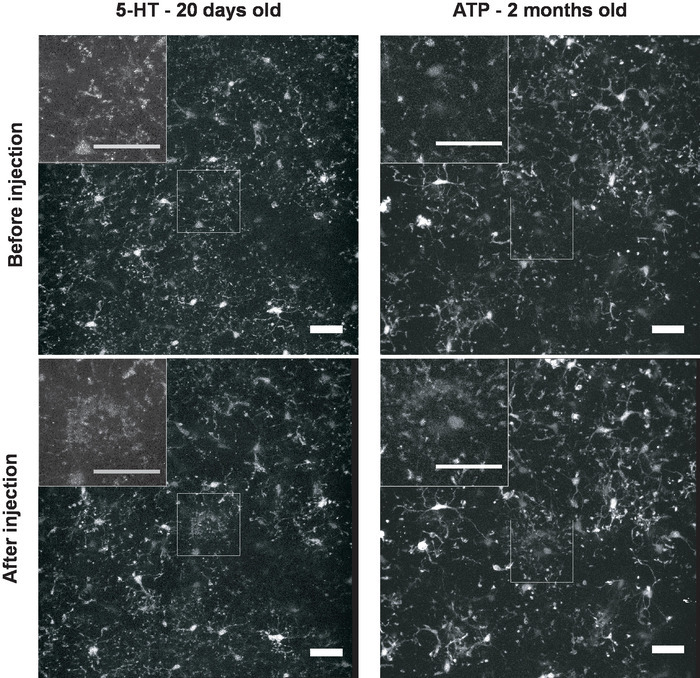 This protocol describes a method to induce, observe, and quantify the oriented growth of microglial processes toward a locally applied compound, for example, ATP or 5-HT, in acute brain slices from young or adult (at least up to two-month-old) mice. Among the factors that contribute to maintaining brain slices from adult animals in a healthy state for several hours is the use of two tools designed to optimize cell survival at two steps of the protocol. 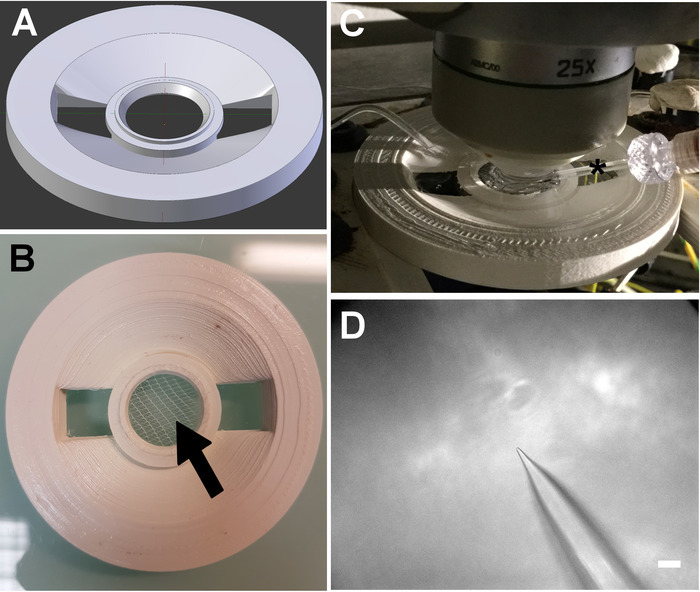 First, the interface slice holder in the interface chamber (Figure 1) improves the conservation of the slices after cutting. Second, the recording chamber (Figure 2) has a perfusion system which allows the aCSF to run both at the top and at the bottom of the slice during imaging. The recording chamber dimensions used here are set to fit standard microscopes as they are similar to classical bath chamber inserts (with a 62 mm outer diameter), but as their models are downloadable from the Supplemental Material, the design can be adapted to fit in slice holders of other dimensions. To note is that each chamber is made by the assembly, without glue, of two perfectly fitting parts, with a polyamide mesh stretched between them. To deliver ATP or 5-HT in a small area and induce a local response of microglia, a pipette containing the compound (visible in Figure 2C,D) is placed with its tip on top of the slice. In the first experiments, it can be helpful to add a fluorescent dye to the solution, in order to visualize the position of the pipette tip on the images that are acquired with the two-photon microscope (Figure 3A). In Figure 3B, it is visible that although the experimenter stopped the pipette descent as soon as its tip touched and deformed the slice surface on the bright-field image of the computer screen, its thin extremity entered slightly into the tissue, down to 80 – 100 µm from the surface. It is important that the pipette is not too superficial because it may not deliver the solution correctly onto the cells, nor enter too deep because it may reach a region where the fluorescence signal is too low. The parameters that may affect the depth reached by the pipette tip are the angle of the pipette, which can be adjusted with the three-axis micromanipulator, and the pipette mouth diameter. Note that, with the projection along the Y-axis (Figure 3B), it is possible to observe that the fluorescence is stronger in the upper than in the lower part of the slice. This is due both to the progressive blunting of the signal inside the slice and to the fact that processes of microglia of the superficial layers of the slice, and some cell bodies, tend to migrate toward the surface. As a result, microglia in the most superficial layers of the slice might show a different morphology than those inside the slice, indicating that they are not in the same state, and may react differently to stimulation. Thus, superficial microglial activation may mask, in the z-projection, the response of the microglia below. In addition, the surface is often tilted, and the first z-images of the stacks are patchy. Therefore, we recommend, for a better accuracy, to exclude the most superficial z-planes from the z-projection and analysis. However, as altered microglia morphology and the presence of debris in the superficial layers are indicators of the condition of the slice, it can be interesting to image the full depth of a slice to check its status a posteriori. This can be especially useful to new experimenters who may not easily recognize abnormal microglia or debris from single z-planes. The z-planes taken in the first 30 µm will then be excluded at the z-projection step (step 5.1.2 of the protocol). Once the slice has been treated with the compound of interest and recorded, the series of z-planes (excluding the first 30 µm, as discussed above) imaged at each time point are projected along the z-axis to make a 2D movie of z-projection images. To note is that in the protocol presented here, the thickness used for the max z-projection encompasses all the z-slices where fluorescence is visible (usually 180 – 220 µm, see step 5.1.2 of the protocol). Therefore, variations in the absolute number of z-slices do not impact the quantification of the response. In contrast, some studies use thinner z-stacks (40 – 60 µm) for z-projection6,7,11,27. This is another option, which comes with the risk to exclude some z-slices which exhibit a response, as we observed that the attractant effect was visible as far as 70 µm (in z) away from the pipette tip in some experiments. If the thinner option is preferred, it is, thus, critical to center the z-stack on the pipette tip in z, and importantly, only z-projections done in the same manner (i.e., using all fluorescent z-slices or using a thin z-stack) can be compared. An R1 region of interest is then defined for quantitative analysis. Figure 4 shows an ROI on a z-projection. The red dashed lines represent the putative position of the pipette. The yellow circle is R1, drawn with Icy, and centered on the putative tip of the pipette. Importantly, we observed that a noticeable variability arose during the quantification from the localization of the R1 ROI, whose misplacement leads to an underestimation of the response. To help positioning the ROI on the site of delivery, we recommend displaying the rulers in the acquisition software when positioning the pipette in the brightfield, in order to place the pipette tip always in the same central XY position in the field to be imaged. This provides an indication of where to position, later, the ROI in the Z-projection of the fluorescence images. However, the final tip position and, thus, the actual site of delivery will be slightly shifted from this central position, depending on the depth reached by the pipette tip. For this reason, to position R1, we take into consideration three other criteria: (i) R1 must be at the tip of the pipette, the position of which is inferred from the dark background in the lower right corner, (ii) it should correspond to the area where a transient distortion of the tissue occurs when the compound is injected, and (ii) it should correspond to the area where a local response (if any) is observed. If this is not sufficient to locate with good accuracy the point of delivery, filling the pipette with a fluorescent compound will help. After having drawn R1, we run the movie again to check that it is well positioned for all the time points and that there are no aberrant drift, distortion, or artifact fluorescence at any time point, which could bias the quantification. The movie corresponding to Figure 4, and illustrating the effect of ATP application, can be found in the supplemental material (Movie S1). We initially studied the attraction of microglial processes toward ATP or 5-HT in the thalamus of P11 mice15. More recently, these experiments were repeated in slices from four-day- to two-month-old mice, and in various regions (for example, Figure 3 corresponds to a recording in the hippocampus). We mostly used three- to four-week-old mice, which combines the advantages of having a mature brain-with mature and ramified microglia-with a good slice viability. Importantly, representative normal-state microglia are characterized by a small soma, long processes with small terminals, and constantly moving processes at the baseline condition. Typically, in slices from 18 to 30 day-old mice, the microglia morphology remains mostly unchanged for up to 6 h after the slice preparation. For slices from older mice (two months old), the ability to maintain the slices in a physiological state is reduced (~4 h). Examples of microglial direction motility in the thalamus, in response to 5-HT in a slice from a 20-day-old mouse and to ATP in a slice from a two-month-old mouse, are provided in Figure 5. The movie corresponding to the 5-HT application in Figure 5 can be found in the supplemental material (Movie S2). Figure 6 presents two suboptimal experiments made on slices kept for longer than 6 h in aCSF before they were imaged (only times 0 are shown). 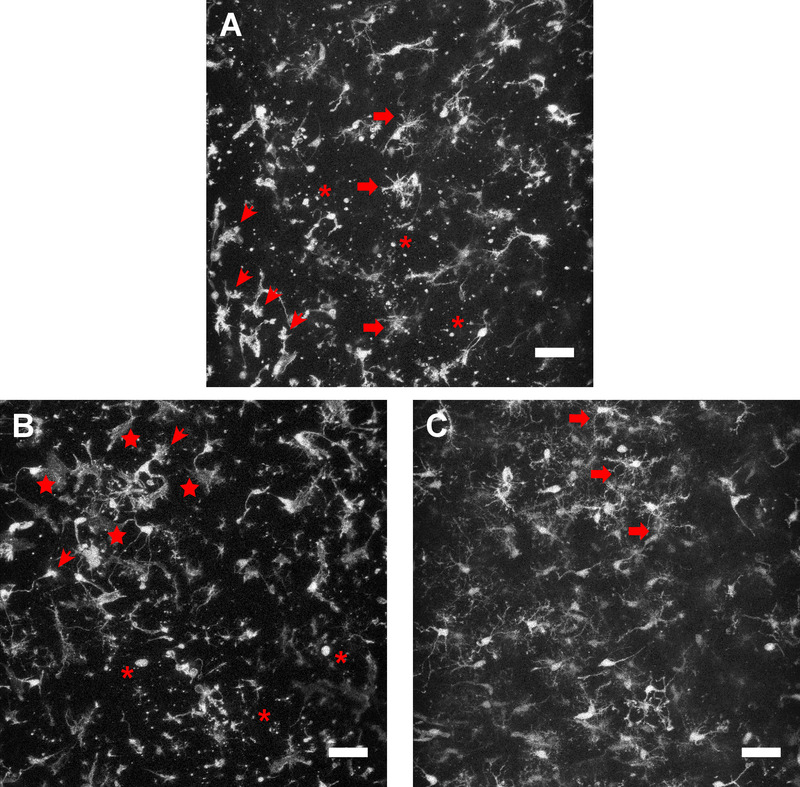 In Figure 6A, note the presence of microglia with multiple short processes or with enlarged terminals reminiscent of neurite growth cones, and the presence of many fluorescent cell debris or particles. These very fluorescent elements stay immobile or move randomly during imaging, indicating that they do not belong to “living” microglia (see Movie S3 in the supplemental material). To note is that, in this particular example, microglia were constantly scanning their environment, but their morphology was so altered that they could not be considered as being in a physiological state. Moreover, the large amount of debris would have made the fluorescence analysis poorly reliable. Figure 6B illustrates the presence of microglia with large and flat cell bodies or protrusions, which can sometimes be found on the superficial layers of slices that have been kept several hours before they were imaged. Only superficial z-positions have been used to make this z-projection. Figure 6C is a substack, at deeper z-positions, from the same brain slice as shown in Figure 6B. Although they are not positioned at the surface, these microglia have an abnormal “bushy” aspect. Due to the aspect of microglia, the movies corresponding to these two slices were not used for quantification. After extracting the data from the 2D-movies, the results can be represented by plotting normalized R(t) fluorescence over time. A graph summarizing several experiments is presented in Figure 7A, to show the variability of the responses. Note that the fluorescence decreases immediately but transiently (in the first three images) after the injection due to tissue distortion (i.e., the liquid injection with the pipette transiently pushes the tissue away, and then increases). The variability in the response to ATP illustrates the fact that even when slices look similarly healthy, with motile and ramified microglia, they do not respond in the same manner (but all of them do respond). On top of intrinsic sample heterogeneity, there is some looseness in the R1 positioning, as mentioned above, and we also cannot exclude an impact of, for example, differences in the volume of the solution which is delivered. Therefore, to detect small effects or variations, it may be interesting to use an automatic device for the compound injection. Figure 7B shows how the size of the ROI also impacts the quantification, here of the growth of ATP-induced processes. Increasing the diameter from 35 (the diameter used in Figure 7A and for all the analyses presented here) to 50 or 70 µm reduces the variability among experiments (slices) by suppressing the issue of the small R1 positioning. However, it also decreases accuracy and the magnitude of the detected response. Indeed, with larger ROIs, there is more background due to processes or cell bodies not affected by the treatment, and a growth of processes can be partially blunted by the concomitant retraction of microglial branches more distant from the pipette but nevertheless inside the ROI. In conclusion, it can be relevant to use ROIs with a different diameter circle than one that is 35 µm, but it is fundamental that the ROI is always the same in all the data sets to be compared. Figure 7C shows the mean ± SEM for several experiments with aCSF, ATP, or 5-HT. The effect of ATP is in the same range as those obtained by other groups with a similar method in vivo (0.5 according to Davalos et al.3 and 0.4 according to Haynes et al.13) and in slices (0.8 if normalized as is done here, according to Dissing-Olesen et al.5, and 0.6 according to Pagani et al.28). On the one hand, differences can come from biological parameters, such as the slice preparation method, the amount of ATP injected, the age of the mouse, or the brain region used, and on the other hand from analysis parameters, such as the diameter of the ROI and the thickness of the z-stacks used for the z-projection (i.e., the whole thickness where fluorescence is detected, or only the 40 – 60 µm around the pipette tip, where the maximal response is expected). In Figure 7C, the aCSF injection is the negative control, necessary to check that the local injection and the pressure of the pipette do not cause an injury that may attract microglial processes. In addition, the aCSF control allows researchers to check that there is no photobleaching over time. Indeed, photobleaching, the photon-induced destruction of the fluorescent proteins or fluorophores, would have induced a progressive decrease of fluorescence over time. As it can bias measurements, it is important to rigorously check that there is no photobleaching in the experimental conditions. To do this, it is recommended to acquire an XYZT series on a slice with GFP-expressing microglia, for 30 min (aCSF can be injected but, actually, no stimulation is needed), with the excitation and acquisition parameters set as in the experimental conditions. Then, a quantitative measure of the fluorescence over time in different regions of interest, including microglia cell bodies or processes, will reveal if there is a gradual loss in emission intensity, usually an exponential decay, indicating photobleaching. If this is the case, some adjustments can be performed: a realignment of the laser, a reduction of the laser power and an increase of the detector gain, a reduction of the number of z-planes, and an increase of the interval between them to limit illumination. Photobleaching is favored by high-power or long (ex: repeated illumination for line averaging) excitation; thus, researchers must pay attention to it if a sustained illumination is used to image cells with low fluorescence. After the local injection of ATP or 5-HT, there is an increase of fluorescence in R1, which reaches a plateau (Figure 7C). In addition to kinetics, it can be interesting to compare the attraction at a stable endpoint. Here, we chose to represent the microglial response at t = 26 min (i.e., 20 min after the injection) in Figure 7D. This is useful to statistically compare compounds, or to test the effect of antagonists which can be added in the bath (i.e., in the perfusion solution, or together with the compound in the pipette [not shown]). Figure 1: Interface chamber details. (A) Outline for the 3D printing of the slice holder. The external diameter of the holder is 7 cm. 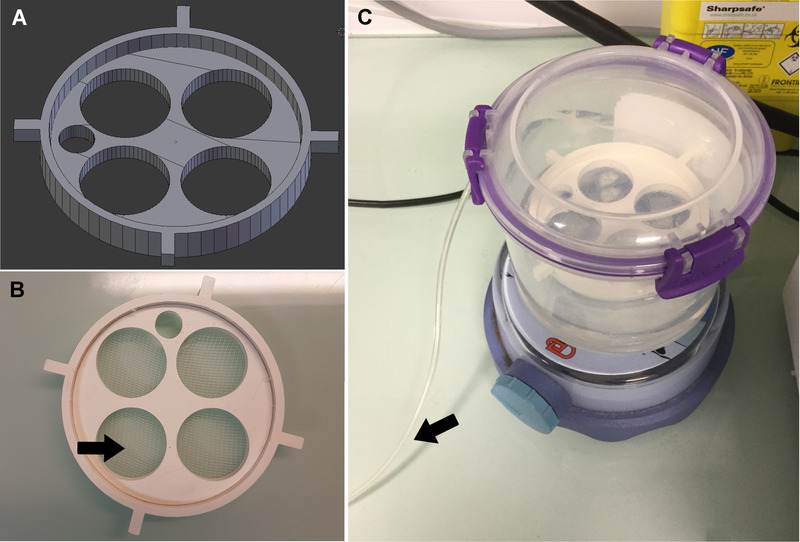 (B) Interface slice holder with the nylon mesh (arrow) that allows researchers to keep slices at the liquid-air interface. (C) Interface chamber device that makes it possible to maintain the slices in a carbogenated (the arrow indicates the tubing for bubbling) and humidified environment before they are imaged. Please click here to view a larger version of this figure. Figure 2: Perfusion chamber details. (A) Outline for the 3D printing. The external diameter of the perfusion chamber is 5.9 cm. (B) The perfusion chamber with the nylon mesh (arrow) that supports the slice, prevents it from touching the slide below, and allows the aCSF to flow above and under it. (C) Picture of the assembly at the two-photon microscope. The micropipette which will deliver the compound locally is visible on the right (asterisk). (D) Pipette imaged in brightfield. The scale bar = 60 µm. Please click here to view a larger version of this figure. Figure 3: Position of the micropipette in the slice. Example of an acquisition of a stack of images (in the hippocampus of a 30 day-old animal) with a micropipette filled with fluorescein (1 µM). Fluorescein makes it possible to locate the pipette (asterisk) in the max projections along (A) the z-axis or (B) the y-axis. Note in panel B that, although fainter in fluorescence, there are also microglia below the pipette tip. In this illustrated example, the full stack, including the images taken in the most superficial part of the slice, has been used for the projections. Scale bar = 30 µm in panel A and as indicated (each graduation = 50 µm) in panel B. The z-thickness of the stack = 220 µm. Please click here to view a larger version of this figure. Figure 4: Positioning of R1, the ROI used for quantification. This figure shows three experimental time points of an experiment where ATP has been applied on a slice (from the thalamus of a 20 day-old animal), with drawings of the putative location of the pipette (red dashed line on the first time point) and the delineation of the R1 ROI. Scale bar = 30 µm. Note the darker area in the lower right corner, corresponding to the shade of the pipette, which interferes with illumination and imaging. Note, also, the small region of intense fluorescence at 25 min, which indicates the location of the pipette tip. The z-thickness of the stack = 220 µm. Please click here to view a larger version of this figure. Figure 5: Microglial responses. Responses to the local application of 5-HT (5 µM) on a brain slice from a 20-day-old mouse (left; the slice z-thickness = 220 µm) and of ATP (500 µM) on a slice from a two-month-old mouse (right; the slice z-thickness = 220 µm). The red dashed lines represent the pipette position. Both recordings have been done in the thalamus, and the upper 30 µm of the slices have been excluded. The images are taken before (upper row) and 25 min after (lower row) the injection. Scale bar = 30 µm. Please click here to view a larger version of this figure. Figure 6: Examples of suboptimal experiments. These slices have waited for more than 6 h before imaging and have been imaged since their upper surface. 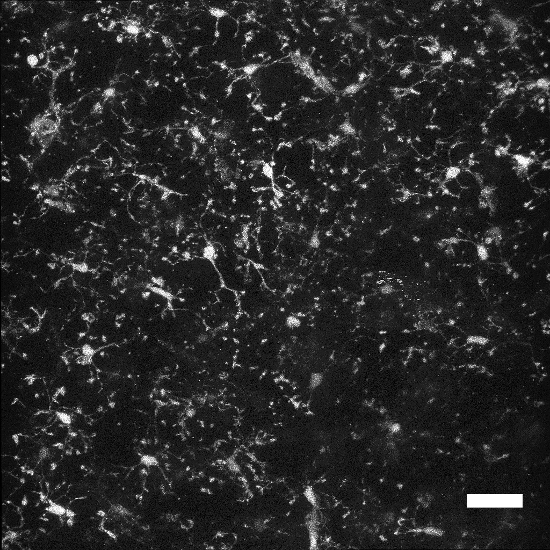 (A) Example of a z-stack with a lot of debris (roughly round, fluorescent particles, but with irregular borders; asterisks) and “bushy” microglia (arrows), that is, with numerous but short processes. Note the enlarged process terminals (arrowheads) which look like axonal growth cones. The z-thickness of the stack = 220 µm. The other two panels show two sub-stacks of the same slice, with (B) 1-30 z-planes (z-thickness = 59 µm) and (C) 30-120 z-planes (z-thickness = 180 µm). On the top planes (shown in panel B), in addition to the large process terminals and debris like in panel A, there are microglia with unusual large flat bodies or protrusions (stars). On the deeper planes (shown in panel C), there is no debris nor flat objects, but the cells are bushy (arrows) and the density is unusually high. Altogether, these observations indicate that the microglia are not in a normal state. Please click here to view a larger version of this figure. Figure 7: Quantification of the attraction of microglial processes. (A) Example of a series of experiments with ATP to illustrate variability. (B) Impact of the ROI size on the quantification. Each experiment shown in panel A (ATP injection) has been analyzed with an ROI of 35, 50, or 70 µm diameter. The mean ± SEM of thefluorescence at each time point is shown for the different ROIs. (C) Summary of experiments with aCSF, 5-HT, and ATP. The aCSF injection has no effect on the location of microglial processes. 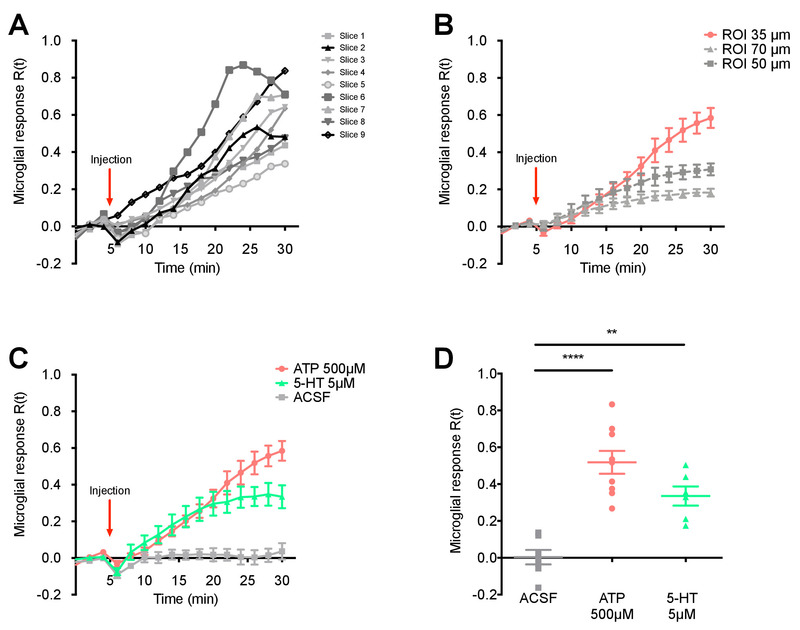 ATP and 5-HT induce a localized growth of microglial processes toward the pipette, measured with the local increase of fluorescence. The mean ± SEM are indicated. (D) Summary of microglial responses at t = 20 min postinjection (26 min from the beginning of recording). The mean ± SEM are indicated. One-way ANOVA with Dunnett post hoc test is used. ** p < 0.01, *** p < 0.001 compared to the aCSF injection. For aCSF, n = 7; for ATP, n = 8; for 5-HT, n = 6. All these experiments were performed in the thalamus, but similar results can be obtained from the hippocampus or cortex. The z-thickness of the stacks used for z-projections and quantification = 180 – 220 µm. All measures except those in panel B have been done with a 35 µm-diameter ROI. Please click here to view a larger version of this figure. Supplementary File: Imaging chamber and Interface holding chamber. Please click here to download this file.